The HMN-60 and HMN-120 are medium expansion foam nozzles suitable for use with fixed proportioning systems, or with handline proportioners for portable operation. These nozzles produce a stable, slow-draining foam with an expansion ratio of approximately 50:1, making them appropriate for vapor suppression. They are designed to produce the most effective vapor-suppression foam when used with NF Universal Gold or Vaporshield foam concentrates. The HMN series nozzles should be operated at an inlet pressure in the range of 55-65 psi (3.8-4.5 bar). Optimum inlet pressure is 60 psi, at which the design flow rate is achieved. Both nozzles are equipped with 1.” NST swivel inlet connections. 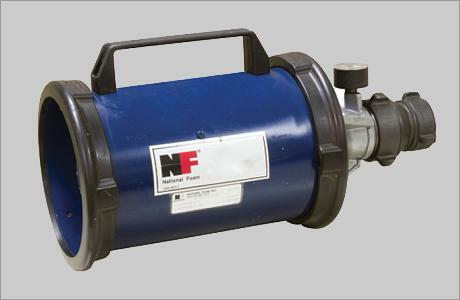 An optional ball shutoff valve is available with the portable HMN series nozzles. Performance characteristics are not affected by the addition of the ball shutoff valve.